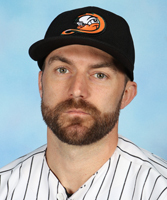 Lombardozzi enters his first season with Long Island, second in the Atlantic League and 12th in professional baseball. The infielder spent six seasons at the game’s highest level, including three with the Washington Nationals (2011-13) and one apiece with the Baltimore Orioles (2014), Pittsburgh Pirates (2015) and Miami Marlins (2017). He appeared in 291 MLB games, compiling a .260 batting average, five home runs, 52 RBIs, 75 runs, 207 hits, 33 doubles and five triples. Defensively, he accrued a .987 fielding percentage while playing four different positions (second base, third base, shortstop and left field). The Minnesota native returned to Major League Baseball in 2017 after playing in the Atlantic League with the Southern Maryland Blue Crabs during the 2016 campaign. In 40 games, he posted a .367 batting average, a .401 on-base percentage, 20 RBIs, 21 runs and 61 hits. The 30-year-old spent the 2018 season with the Triple-A Nashville Sounds in the Oakland Athletics organization. He played 120 games, hitting .243 with 42 RBIs, 67 runs, 100 hits, 15 doubles, 51 walks and a .993 fielding percentage. The St. Petersburg College alum previously earned back-to-back MiLB.com Organization All-Star selections with the Nationals organization in 2010 and 2011 and received an MiLB Gold Glove in 2011. He earned South Atlantic League Post-Season All-Star honors in 2009 after hitting .296 with 58 RBIs, 90 runs, 147 hits, 26 doubles and a .987 fielding percentage with the Hagerstown Suns. Lombardozzi was originally selected by the Nationals in the 19th round of the 2008 amateur draft.